The type of accommodation you choose really depends on the style of holiday you are looking to take. If you are a very laid back, book-as-you-go kind of person, a hostel might be right on the mark. But if you like a bit of luxury and have saved for a long time, a highly ranked hotel is probably best. 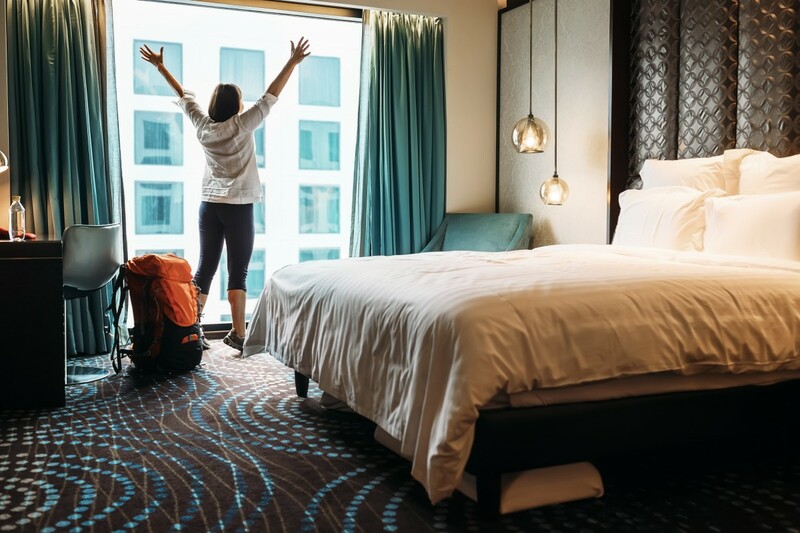 Here, we break down the different types of accommodation and what they can and can’t offer, so you can decide what’s right for you. Staying in a hostel is a great way to save money while putting a roof over your head so you can spend your savings on those once-in-a-lifetime experiences. Hostels generally attract younger travellers although, some senior travellers are really breaking this mould. If you don’t mind bunking up, you can book a share room which accommodates around 6-10 people and save big bucks. If sharing isn’t your thing but you still want to save money, you can choose smaller rooms with only 4 people in them or a couple’s/private room. On average in Australia, you could be looking at roughly $20 per night for a large share room, $37 p/n for a smaller share room and upwards of $90 p/n for a double/private room. The less people in a room, the more you will spend. Hostels are a really great option if you like meeting new people along the way. They offer fun, cheap, in-house entertainment such as trivia, karaoke and games nights! Some hostels even offer guests jobs, so don’t be afraid to hand your CV in at reception – you might get lucky! Be prepared though, hostels do attract the party travellers who can be known to make noise. As much as this is frowned upon, many hostels have their own bar/nightclub so don’t expect serenity every night – you won’t get it! Another thing to look out for is individual cleanliness – Some people are not keen on cleaning, whether this is themselves, their part of the bedroom or the toilets and kitchens. Keep this in mind when choosing your type of accommodation as this really could have a huge impact on your stay! Top Tip: Make sure you have a safe/lock box, either in the room or at reception, where you can store expensive and important belongings when you need to go out. If you are in a share room, most travel insurers will not cover theft or loss of unprotected valuables as there are strangers in your room and you must take due care to protect your belongings from these unknown persons. Bed & Breakfast’s are essentially a step up from private room accommodation at hostels. They can still offer budget prices but include breakfast as part of your accommodation package. Bear in mind though, this can increase your accommodation cost a little bit. Some B&B’s really go above and beyond with their culinary offerings which can extend to sophisticated dining menus and gourmet hampers. Others simply offer continental style breakfast with a cup of tea or coffee. Whatever your style, you can find out what’s included in the room rate prior to booking! B&B’s are usually smaller than hotels and hostels, offering only a few rooms or suites. Given this, staying at a B&B offers peace and quiet for the more relaxed traveller. Be sure to take a good look at the room rate as you will often see some really great value when it comes to automatic inclusions within the price. These can include a view, welcome gift, your own private garden, onsite / undercover parking, pet-friendly accommodation, use of communal sitting areas, walking trails at your back door and more! B&B owners often live on site. They can offer a much more personalised touch as they care a lot about their business and their guests’ stay. They can usually offer a really in-depth knowledge of the local area and recommend great day trips, experiences etc. However, B&Bs tend not to offer porters to assist with luggage or a 24/7 receptionist to help with any midnight issues you have. Top Tip: There are many different types of B&B owners, some being very laid back and others being very hands-on. Get a feel for the owners by looking at reviews from previous guests as they could highlight things you may not have thought of such as a shared table for breakfast. Hotels were set up to provide luxury accommodation with many amenities included such as gyms, pools, bars and restaurants. Nowadays, the range of hotels varies greatly from budget hotels to 5-star deluxe accommodation which promises to cater for all your needs and wants. Hotel stays are generally more expensive with some charging for additional amenities such as parking (upward of $30 a night), wifi and room service. Bear this in mind when deciding which hotel to choose as these really can increase your spend without you having realised it prior to arriving. Hotels come in all shapes and sizes but be sure to look out for sales or seasonal bargains as this can really reduce the overall price you are paying. When booking your trip with a travel agent, look at holiday packages and see if this saves you any money. Sometimes booking everything separately costs more although, you can avoid those commission add-ons. If you have the time to do a lot of research, you can find 5-star luxury accommodation for a reasonable price! Hotels can offer those luxury little details that make you feel really pampered for example, porters to carry your luggage or complimentary shuttles to and from the airport. Top Tip: If you like to use hotel booking websites, make sure you log in before doing a search. These sites tend to reward loyalty and prices shown to logged in users are often less than those displayed to unidentified users. Alternatively if you want to remain anonymous, clear the cookies from your browser – this way the booking website will think you’re a new visitor and may show you different properties and different prices. Whatever your budget, make sure you arrange travel insurance when you’ve paid any part of your trip costs. Ensuring you have adequate cancellation cover means that should the worst happen, you aren’t at a major loss with nothing to show for it!